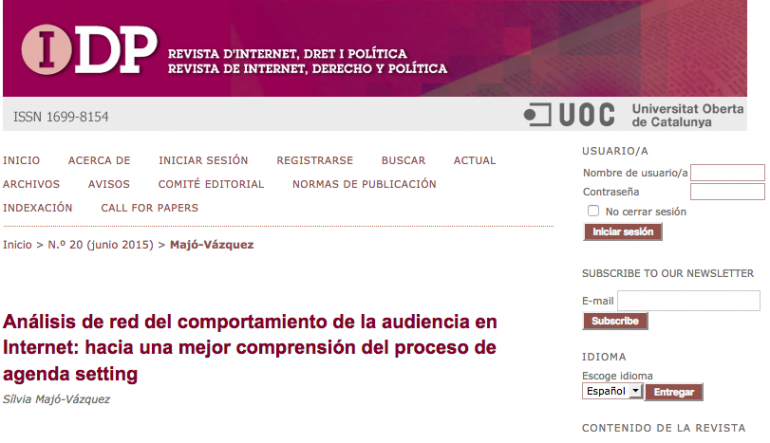 By constructing the network of media audience, this study sheds light on the predominant modes of exposure to online political information in Spain. Novelty data from a panel of thirty thousand individuals is used for the research. The preliminary results bring evidences for reviewing the line of reasoning that advocates for the prevailing fragmentation of the public sphere. More notably, the results contribute to proving that a substantial level of audience concentration still remains in the web. The highest levels of audience overlapping are found in those media outlets that are driving the media agenda in the offline sphere. Therefore the study proffers evidence that the structure of the online public sphere might guarantee the necessary shared informational experiences for a deliberative democracy. The implications of the current networked audience behaviour for the study of the agenda setting process are discussed along with the chances for a shared public agenda in Spanish society. Observational methods and content analysis have been used in the study of the agenda setting process so far. However, the current communication environment characterized by unlimited, decentralized and abundant sources of political information prompts the application of new analytical approaches. Networks are at the heart of online communication and network science allows for analyzing its structure. It provides the affordances to map and study audience aggregated behaviour when searching for political information. In doing in so, it also unveils the mechanisms that might still guarantee a public agenda in the digital age.